FS2004 – Beaver Creek CYXQ. Beaver Creek is located at mile 1202 of the Alaska Highway, just east of the Alaska/Yukon border. The populaton is around 100 and the main employment is with the Border Agency, the White River First Nation, or with local tourist lodges. The airfield is a mile further north of the town and close to the Canadian border post, which is included in the scenery. It was built by Jack Stalberg in the 1960’s, and I have no further information beyond the fact that he loved to fly. 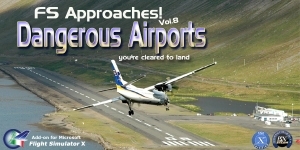 The airport serves as an “airport of entry”, though it is restricted in hours of opening and in the size of aircraft that it can handle; only up to a maximum of 15 seats. The single runway is 3,745 feet long and 100 feet wide, gravel, aligned 13-31 in FS9, lit, and with vasi at both ends. Righthand circuits for runway 13. There is a 340 feet threshold displacement to runway 31, which is of course unmarked on a gravel runway. The terminal building was recently reclad. The ai reflects the sort of traffic the airfield gets; ie brief paperwork stopovers for GA or small charter flights into Canada from Alaska, usually in the mornings.I have adjusted the local scenery terrain levels to remove adjacent hills that I believe do not exist in real life but are part of the Northern Canada terrain mesh that I have installed. If you do not have this mesh you may find that the scenery works fine for you without the API flatten that is included here. The airfield is at 2,129 feet ASL. FS2004 – Smithers CYYD Airport. Smithers is in northwest BC, 60 miles east and a bit north of Terrace, and directly east of the southern border of Alaska. The town has a population of 5,500 and is set in a north-south valley between mountains, the most impressive of which is Hudson Bay Mountain to the west. The airport is to the north of the town and has a single runway of 7,544 feet, aligned 33-15. The main user is Central Mountain Air, who are headquartered in Smithers and have a large maintenance hangar there next to the terminal building. The airport has scheduled flights by Central Mountain Air, Jazz, and Hawk Air, which are in the AI. The AI provided here is a new CYYD traffic bgl; in total the AI also includes a Dawson Creek traffic bgl (recently revised and posted) plus a Terrace traffic bgl (which will shortly be revised and posted). An Electra of Conair (who are the largest operator of fire fighting planes in BC, and have re-fill tanks in Smithers) is included and also a HS 748 of Air North. The “no parking” writing has replaced the original marking; the latter was easier to make than the former so I took the easy route. FS2004 – Bella Coola CYBD Airport. Bella Coola is in one of the deep east-west fjords amid the Coastal Range on the coast of BC, approximately mid way between Vancouver and the Alaskan border, and some 70 miles inland from the open ocean. The town of Bella Coola has a small population of around 150, while the population of the whole Bella Coola Valley is around 2,000. Warmer in both summer and winter than the surrounding area, tourism flourishes along with forestry, fishing, and local government administration. Although there is road access, the ferry service is the main connection to larger coastal towns or cities such as Vancouver. The airport, 7 miles east of the town, is connected by daily Pacific Coastal flights to Vancouver and Anahim Lake (to the east). The asphalt runway is 4,200 feet long and aligned 04-22 in FS9 (by 2010 this had changed to 05-23 in reality) and is without lighting of any sort, so it is restricted to daylight hours only. At the eastern end is the terminal building and in the middle the West Coast Helicopter hangar, which has a large fenced paddock-like enclosure in front of it. The helicopters hop over the three feet high fence as they “taxi” to the apron in front of the hanger. Between the two there are four other company hangars spread out along the roadway beside the fence. I have never seen the airfield in Summer, and I have not attempted to replicate the apron as it now shows in Google Earth. FS2004 – Scenery Golden CYGE. British Columbia, Canada. This airfield is in one of the north-south valleys in the Columbia Mountains (which are part of the Rockies) on the border between BC and Alberta. The town of Golden (population just under 4,000) grew along with the Canadian Pacific Railway and the logging industry, both of which are still the mainstay of the town. Tourism is a more recent development along with the Kicking Horse Mountain Resort, which is only 3 miles to the west of the town. There are occasional flights into CYGE related to the richer echelon of tourist groups for Kicking Horse, particularly at the weekends; three actual such flights are included in the AI. FS2004 – Repulse Bay CYUT in Nunavut Canada. This is a scenery that I started in 2013, temporarily abandoned when I found there was a fault in the coastline that reduced it all to straight lines, and then totally forgot about. Until now, when I discovered that while I had made the Repulse Bay terminal building I had mysteriously not made the scenery. Investigation revealed the reason why and here it is with a coastline that has been repaired to the extent that the fault allowed. Repulse Bay has a population of around 1,100 and since 2015 has been officially named Naujaat, the traditional Inuit name. It is located exactly on the arctic circle on the northern extension of the western side of Hudson Bay, in a large bay off the northern tip of Southampton Island. Coral Harbour is on the far side of the island, 180 miles to the south. The airfield is alongside the town and the coast, with the runway 3,400 feet of gravel with PAPI at both ends, aligned 161T-341T with “T” standing for true as opposed to the unreliable magnetic bearing this far north. The regular scheduled flights are by Air Baffin (an Air Nunavut subsiduary), connecting to Iqaluit some 550 miles to the east. The helicopters are there in the summer with their own fuel in drums around their own parking apron. They land directly on the apron, which cannot be replicated in AI, so they are present only as parked choppers and not flying ones. FSX – Will Rogers-Wiley Post PABR, Barrow Alaska. Completely re-done. All the custom buildings, many photo textured, have been adapted from Roger Wensley’s PABR scenery for FS9. Thanks, Roger. RWY designation changed to 7-25, ILS freq updated to 110.5 and back course enabled. Defunct WILEY NDB removed. Realish.